A privacy fence is, in short, not short at all. Basically a privacy fence is any fence that is tall and not see through, which therefore gives the space it contains a more private feel. Privacy fences are great for residential situations where houses are close together but you still want an element of privacy in your own backyard. A privacy fence creates a personal space where you can relax and unwind. Privacy doesn’t necessarily have to be about removing yourself from prying eyes, though of course it is good for this purpose. Privacy fences are also good when you just want some time alone instead of engaging in conversation with a neighbor. 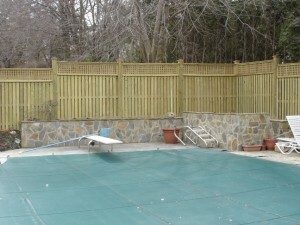 Wood fences are the most conducive fences for privacy, because the boards can prevent people from seeing through and can also be built tall enough to prevent anyone from seeing over. This 6 feet high board on board wood fence turns the pool in the backyard into your own private swim club, and the square lattice adds a nice decorative, yet understated, touch. This entry was posted on Thursday, January 9th, 2014 at 10:26 pm. Both comments and pings are currently closed.